"Removal" of the Native people east of the Mississippi to lands in the west as a policy of the United States originated with Thomas Jefferson, who was elected President in 1801. Jefferson made a deal with the state of Georgia in 1802, promising to secure the title to all Cherokee land within the state in exchange for Georgia giving up it's claim on territory that later became the states of Mississippi and Alabama. In 1803, the Louisiana Purchase transferred title of a vast area west of the Mississippi River from France to the United States, giving Jefferson the means to not only honor the deal with Georgia, but also to solve the "Indian problem" in the eastern U.S. His plan was to acculturate the Indians, manipulate them into incurring trade debts, and then pressure them into paying off those debts by exchanging their land for parcels of the newly acquired U.S. land in the west. Indian nations that refused to be assimilated would be removed by force. Many Indian nations did make land cessions in following years. By 1819 Cherokee territory had been reduced to the point that they felt they could cede no more. The Cherokee National Council passed a law that required Council approval of any future land transfers, and the penalty for violating the law was death. In 1828, pressure for Indian removal to the west greatly increased after the Cherokee adopted a constitution and a republican form of government modeled on that of the United States and began publishing a bi-lingual newspaper, the Cherokee Phoenix. This enraged many citizens of Georgia, and when the discovery of gold on Cherokee territory began to be public knowledge, Georgia's desire for the land reached a fever pitch. In November 1828 Andrew Jackson, who was known to favor Indian removal, was elected President. Barely a month after his election, the Georgia state legislature passed a law annexing Cherokee land in the state, extending Georgia state law over the Cherokee, declaring all Cherokee laws null and void after June 1830, and banning all Cherokees (and Creeks) as witnesses against any white man in court. This was the first of a series of oppressive laws aimed at forcing the Cherokee out of Georgia. The Cherokee refused to recognize Georgia's authority on Cherokee land, and the state began to actively harass Cherokee citizens. In his State of the Union address in December, 1829, Andrew Jackson proposed that the president of the United States be authorized to exchange land in the west for Indian land in the east and to assist the Indians with their "removal". This exchange would require ratified treaties and would be "voluntary" for the Indians, but for the tribes who refused Jackson made it clear that their existence as nations would not be tolerated and they would be subject to the laws of the states. In February 1830 Jackson's proposal was introduced in Congress as legislation commonly referred to as the Indian Removal Act. The bill was very controversial and the debate in Congress was fierce, with opposition in the Senate lead by Theodore Frelinghuysen, who gave a 6-hour speech against the bill at one point. Daniel Webster, Henry Clay, and David Crockett, among many other legislators, also opposed it. Senators and Congressmen on both sides of the issue introduced many memorials from their constituents supporting or opposing the bill. 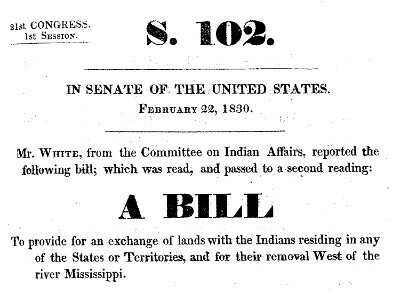 On April 26, 1830, the Indian Removal Act passed the Senate on a vote of 28 to 19. A month later, the Jacksonians finally won the fight when the act passed the House by an even narrower 6-vote margin, 103 to 97, on May 26. Jackson wasted no time in signing the bill into law on May 28, 1830. Copyright © 2013 Bernice Davidson. Used by permission. The Choctaw signed the Treaty of Dancing Rabbit Creek in September of 1830 and were the first to be "voluntarily" removed to Indian Territory. 5,000 Choctaws remained in Mississippi, eventually establishing a reservation in 1944 and gaining federal recognition as the Mississippi Band of Choctaw Indians in 1945. Many Muscogee (Creek) had already emigrated west under earlier treaties. In 1832 leaders of the Muscogee remaining in Alabama signed a removal treaty, but the majority resisted leaving their ancestral homeland and in 1836 the U.S. army began the forced removal of the remaining Muscogee people. Some managed to avoid removal and stayed behind and eventually gained federal recognition as the Poarch Band of Creek Indians. The Seminole in Florida signed the Treaty of Payne's Landing in 1832, agreeing to move west if suitable land was found. A delegation of chiefs toured the proposed area and supposedly signed a treaty at Fort Gibson in Arkansas Territory in 1833, agreeing that the land was acceptable, but when they returned home they renounced the treaty, with some saying they never signed it and others saying they were forced to sign. The majority of Seminoles refused to move, and tensions eventually erupted into the Second Seminole War in 1835. This war lasted 7 years and resulted in the forced removal of just over 3,000 Seminoles. A small number of Seminoles managed to hide out in the swamps of south Florida. Despite a Third Seminole War in the 1850's, they never signed a peace treaty and their descendants are still there. The Seminole Tribe of Florida and the Miccosukee Tribe of Indians are both federally recognized Indian tribes. The Chickasaw in Mississippi signed a removal treaty in the summer of 1830, but suitable land in the west could not be found. 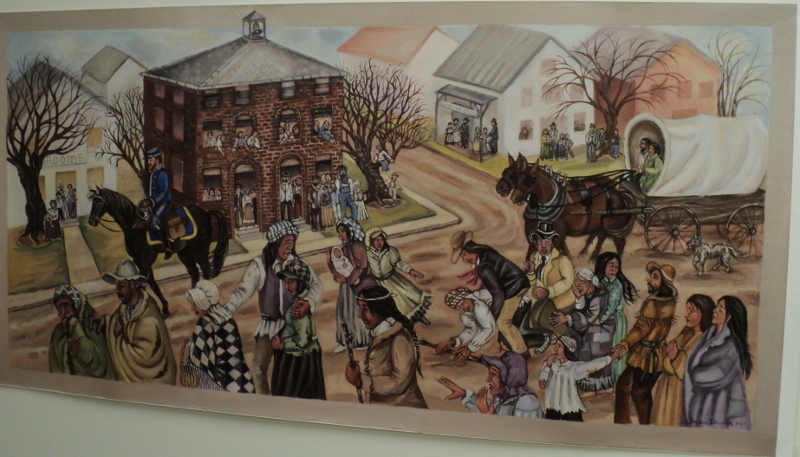 In 1832 they agreed to accept financial compensation for their land. In 1837 they bought part of the Choctaw's land in Indian Territory and removed to the west. The Cherokee resisted removal by legal means, petitioning the United States Supreme Court for relief from Georgia's anti-Cherokee laws, arguing that the laws were unconstitutional and violated treaties with the Cherokee. They eventually won their case in 1832 with the Court ruling in Worcester vs. Georgia that the Cherokee nation "is a distinct community occupying its own territory in which the laws of Georgia can have no force". This was a hollow victory however, because President Andrew Jackson refused to enforce the decision, leaving the Cherokee at the mercy of Georgia's predations. Faced with what they perceived to be a hopeless cause, a minority group of Cherokee leaders signed the Treaty of New Echota in 1835, agreeing to move to Indian Territory. Although the majority of the Cherokee and their elected government disavowed this treaty, the United States used it as the basis for forcing the Cherokee to remove to the west in 1838. A small group of Cherokee avoided the removal and eventually organized as the Eastern Band of Cherokee Indians in North Carolina. Although the Indian Removal Act was aimed mainly at the Indian nations in the South, it was also used to negotiate removal treaties with the Shawnee, Sauk and Fox, Potawatomie, Ottawa, Omaha, Miami and other smaller tribes. Some historians see a direct link between Andrew Jackson's refusal to enforce the Supreme Court decision in Worcester vs. Georgia and the outbreak of the Civil War, 23 years after the Cherokee were forcibly removed. A case can be made that letting Georgia in effect nullify federal law strengthed the South's position on state's rights. The case for this link to the Civil War has been made at least as far back as Horace Greeley's American Conflict: A History of The Great Rebellion, published in 1864. If you accept that connection, it may not be too much of a stretch to say that the Indian Removal Act played a role in sending the entire United States down a Trail of Tears. 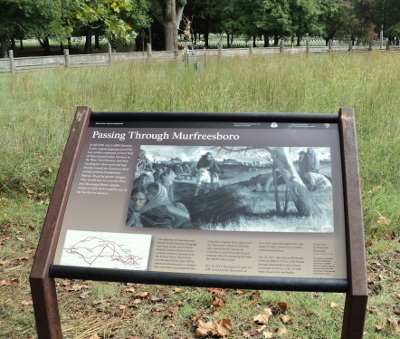 The Cherokee passed through Murfreesboro on the Trail of Tears in 1838, following what's now Old Nashville Pike, which lies beyond the rail fence. The Stones River National Cemetery is visible in the background. 2,971 men are known to have died in the Battle of Stones River during the Civil War in 1862-63. 1823 Nashville Toll Bridge Site - Nashville's first bridge, opened in 1823, was used by the Cherokee during the Trail of Tears in 1838. A remnant of the bridge structure is still visible in downtown Nashville. David Crockett State Park - In Lawrenceburg, Tennessee, is named for the Tennessee frontiersman who opposed the Indian Removal Act of 1830 and fought and died at the Alamo in Texas in 1836. 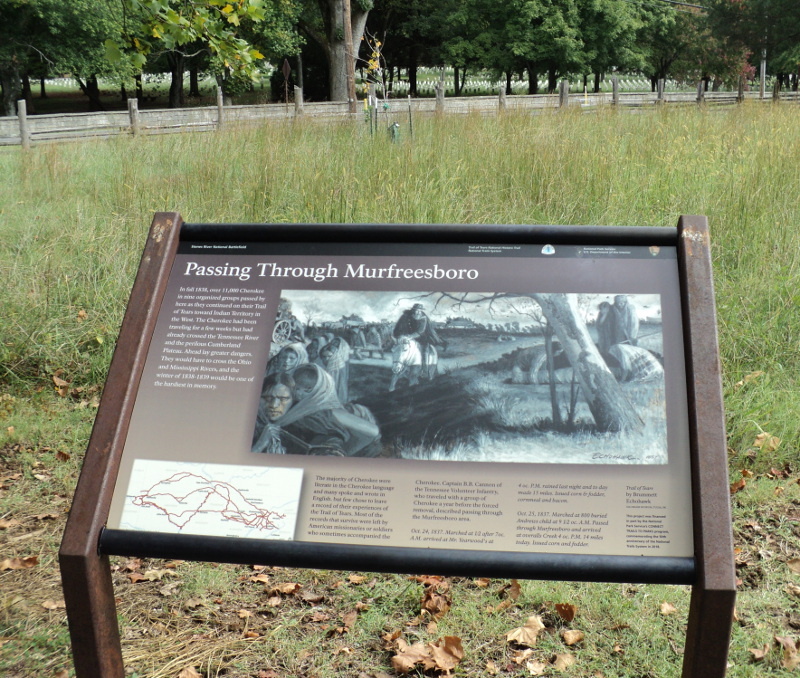 The park features the "Trail of Tears Interpretive Retracement Trail" where visitors can hike intact sections of the original road used by a detachment of Cherokees who passed through the park on the Trail of Tears in 1838. Chickasaw Treaty Council Of 1830 - The first treaty council held under the Indian Removal Act took place in Franklin, Tennessee during the month of August in 1830. The Franklin Masonic Hall, where the Chickasaw delegation met President Andrew Jackson, still stands and is a National Historic Landmark. Old Jefferson - A hikable section of the Trail of Tears National Historic Trail crosses the Old Jefferson Site, located on Corps of Engineers property in Rutherford County, near Smyrna, Tennessee. Port Royal State Park - Once used as an encampment site by the Cherokee on the Trail of Tears, this Tennessee state park is an official site on the Trail of Tears National Historic Trail. Features "The Trail of Tears" hiking trail, an original, preserved section of the Trail of Tears certified by the National Park Service. Pulaski / Giles County Trail of Tears Memorial - Located in Pulaski, Tennessee, commemorates the history of the Trail of Tears in the area. Stones River National Battlefield - The Cherokee passed through what is now Stones River National Battlefield in Murfreesboro, Tennessee, during their forced emigration to Indian Territory during the Trail of Tears in 1838. The route through the battlefield is part of the Trail of Tears National Historic Trail.